Bill Malkmus and enologist William Fuller founded Tualatin Vineyards in 1973. They purchased 160 acres near Forest Grove and planted an 83 acre vineyard. Fuller had worked for Napa Valley’s Louis M. Martini Winery for nine years. Tualatin became one of Oregon’s biggest brands by emphasizing white wines, mainly Chardonnay. The winery’s history is filled with gold medals from the 1970’s, 1980’s, and 1990’s. Fuller was one of the most respected winemakers in Oregon. The winery was sold to Willamette Valley Vineyards in 2005. 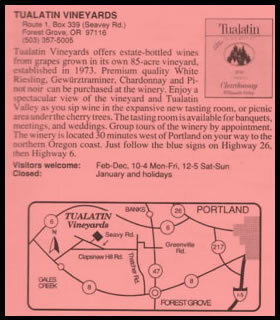 “Tualatin” comes from an Indian word meaning “easy flowing”, probably referring to a river, and not wine!